Drinking water is an important part of a healthy lifestyle. How much water should a person drink a day? Good question! Drinking enough water is an important part of living a healthy lifestyle. While most of us spend time thinking about how well we eat, not as many of us think about how well we drink. The human body is made up of mostly water - by over sixty percent! Water hydrates cells, balances electrolytes, and flushes toxins from major organs. All of your tender tissues and mucous membranes rely on water in order to do their jobs. If you're not getting enough water, your body will stop working efficiently. A good gauge to know whether you are drinking enough water is the color of your urine. If it is clear or a very faint yellow, you are most likely well hydrated. If your urine is a dark golden color and has a strong smell, you are probably not drinking enough water. Other factors also influence how much water you need to drink. Age is definitely a factor that influences the answer to how much water should a person drink a day, because your body's ability to conserve water diminishes as you get older. People living at high altitudes (8,000 feet and above) need to drink more water because their breathing rates increase due to the decrease of oxygen saturation in the air - faster breathing equals faster water loss. The same goes for athletes, whose increased breathing and sweating cause them to lose water more rapidly.Another factor in how much you need to drink is your overall health. People living with a chronic disease are far more prone to dehydration than others. Especially susceptible to drying out are those with diabetes, kidney disease, digestive ailments, alcoholism, and adrenal disorders. Talk to your doctor about your water intake, if you have these or any other chronic medical condition. Pregnant woman are yet another special case: the Institute of Medicine recommends that pregnant women drink ten cups of water a day, and breastfeeding women need to drink at least thirteen cups a day. What's the best way to make sure you're drinking enough water? Here are some tips to help you along. Drink one full eight-ounce glass of water first thing in the morning. 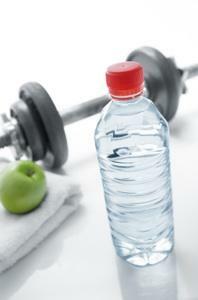 Hydrate well both before and after exercise. If you are drinking alcohol, alternate a glass of water with every alcoholic beverage you consume. Drink one full eight-ounce glass of water ten to fifteen minutes before every meal. Add a slice of lemon or cucumber to your drink to spruce it up a bit. If you spend your day at a desk, buy a nice water pitcher. An attractive water container will encourage you to drink more and prevent you from having to get up every few minutes to refill your cup. Juice, Tea, and Gatorade Are Not Water! While flavored beverages are tasty, they do not necessarily count as water. Caffeinated drinks such as soda, tea, and coffee cause your kidneys to go into overdrive and will actually dehydrate you. Juices, which tend to be high in sugar, also dehydrate the body. If you want to enjoy your fun drinks, it's recommended that you drink an eight-ounce glass of water for every eight ounces of non-water you consume. If you think that you are severely dehydrated, please call a health care provider right away! Actually, you can drink too much water. When you drink too much water, the electrolyte content in your blood becomes diluted. This condition is called hyponatremia, and is usually only a concern for endurance athletes. Some conditions, such as drug abuse, may also cause a person to drink too much water. If you are still wondering how much water should a person drink in a day, you should talk to your doctor about your own special circumstances to see how much water you should be drinking. A Mayo Clinic article on water and the human body. The Center for Disease Control has more information on how much water you should drink. The NIH's page on dehydration. The Mayo Clinic also hosts information on dehydration.